Effectively managing water resource issues requires high-quality data regarding the current conditions in river corridor. 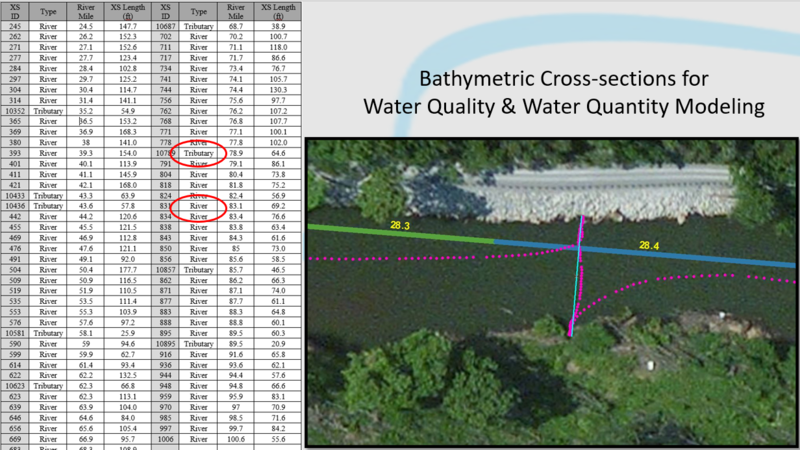 The collection of accurate bathymetric cross-sectional transect data is an important task in developing an accurate water quality model for a stream or river. We can collect transect data from both kayaks or wading in any size stream (Figure 1). Figure 1. 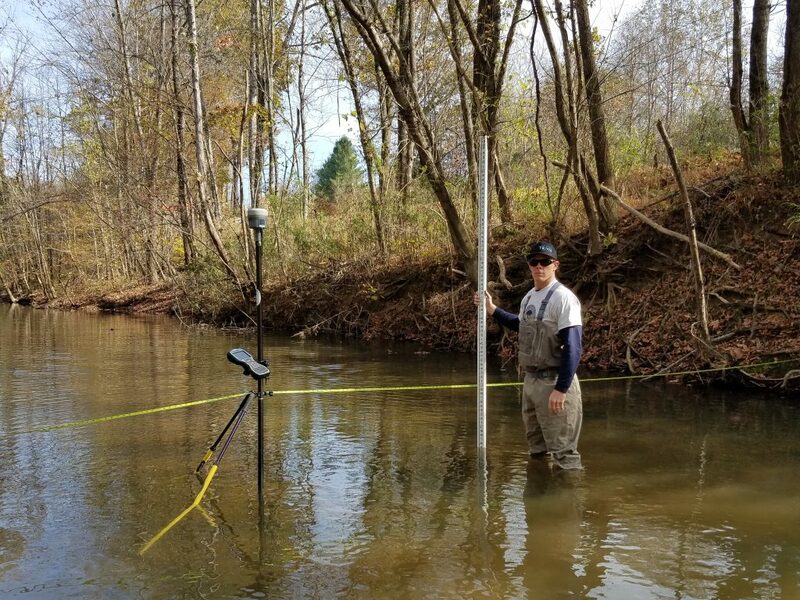 Brett Connell of Trutta Environmental Solutions collecting cross-sectional data on Pigeon Roost Creek in Tennessee. Transect data are plotted in ArcGIS to identify the cross-section points from HDSS longitudinal points. A line is created through the points and the points are snapped to the line (Figure 2). The cross-sectional data are then assembled with an ID (referring to the river mile), the water surface elevation, the vertical error associated with the water surface elevation, coordinate information for each point location, and the bottom elevation for each point. We collect cross-sectional transects at set intervals along the main channel and at tributary confluences and other hydraulically important locations. Figure 2. Example of cross section data (magenta dots) and final line (thin, light blue line) created in post-processing. The number on the thick green and blue line refer to the river miles in 0.1 increments. This example is from the Harpeth River, TN. 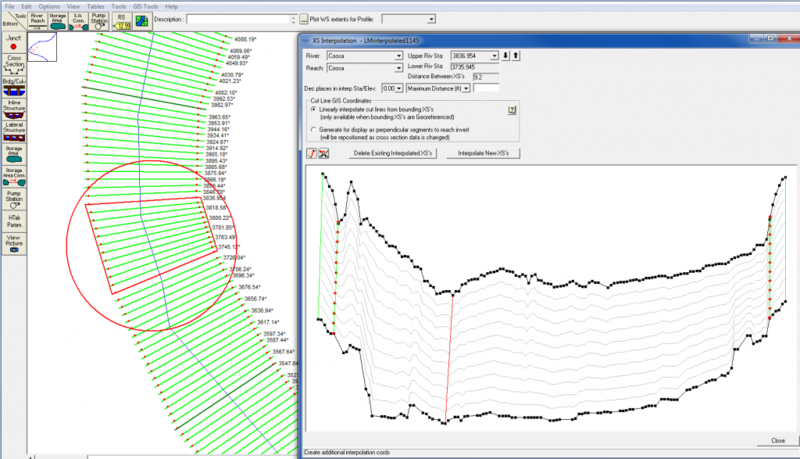 Cross-sectional transects can be used for modeling purposes to estimate water quality at different water surface elevations or to determine how much stream bottom is inundated at different discharge amounts. For example, cross sections below the Logan Martin Dam in Alabama were used to quantify mussel habitat at different discharge rates (Figure 2). Figure 3. HEC-RAS output associated with the Coosa River Bathymetry project.